Sometimes there is no other way to say it than through humour. We have taken the most vulnerable in society, and we have lied to them. We have lied as a profession. We have allowed our "regulators" to lie and to collude with lying. The best and most intelligent of our profession have remained silent. "Who's gonna investigate the man who investigates the man who investigates me" was the refrain of "The Investigator's Song", words and music by Harold Rome/Zero Mostel in 1947. The song's final line: "One more problem puzzles me; Pardon my strange whim. But who's gonna investigate the man who investigates the man who investigates... him?" 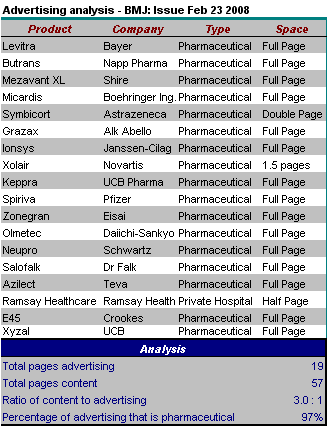 This is the British Medical Journal Advertising analysis for this week. Internal incompetence and a lack of scientific interchange that prevents picking of even low-hanging fruit. Midgets cannot reach that high, especially when all the giants have been removed. "It reflects public opinion that is risk averse, sparked by fears such as the reported patient deaths caused by merck's painkiller Vioxx, or GSK's diabetes drug Avandia. Cautious regulators have responded by imposing ever tougher barriers that must be overcome to approve new medicines." Anyone who wishes this industry well (as I do) must realize that to summarize the problem as a public relations issue is not going to help anyone - least of all the industry itself. The health of this industry (including its long-term financial health) would benefit if a few of its leaders were sent to prison. There was however a decent article by Ray Moynihan on the subversion of Medical Education by commercial companies. The "Better Together" advertisement for Ezetimibe did not appear this week. Neither did the problematical testosterone advertisement. (PMPA-London) There has been much excitement over the mysterious prediction of the Vytorin clinical trial (Enhance) and how and what Schering Plough knew and when. Schering Plough has been dogged by accusations and questions about predictive sales of stock, reporting delays and misconduct. There have been questions about mathematical expertise and honesty. Now it appears that the mystery is solved. An unnamed insider initially reported that a Schering Plough executive was about to eat his breakfast, when an unusual toast pattern caught his eye. "I was about to butter my toast when I realized that there was an unusual pattern of darker crumbs which meant that the Enhance trial was a bust". "It was the beginning of the end, and I immediately went out and sold £25,000,000 worth of my company stock" the executive added. The actual piece of toast has been retained by Congressional and State investigators and the original toast is copyright to Schering-Plough CEO Fred Hassan. We can therefore only show this image of an unmanipulated slice of toast. Ever since news of the parallel scientific universe of the ENHANCE study made headlines, Schering Plough and Merck have been inundated with requests to explain several mysterious events. "Now we are satisfied that everything is fully explained" said Hassan. "There has been no fraud. We need to look at the totality of the evidence, including the toast." "This is astounding news" said Dr Nissen, "seeing is not believing". "God in heaven forbid that a company profit from helping sick people" said a spokesperson from the Center for Medicine in the Public Interest (Drug Wonks). "Why don't we just not offer any treatment and then we will never have to worry about being accused of conducting shoddy science". "We'll just have thousands of people dying of heart attacks all over the place. Of course there will be arguments about the meaning of the toast. It remains a pity, though, that so much premature confusion has been created in the minds of the public simply by individuals who want science to work in the way it has traditionally worked". 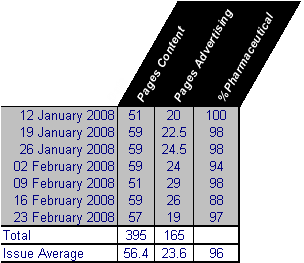 Comment: A full three pages of advertising was devoted to something other than Pharmaceuticals (11.6% of total). The 11.6% comprises an advertisement for the army, half a page on Ramsay Healthcare (a private hospital network with links to the Labour Government), a clinical trials register, and child care provision. There is nothing at all in the BMJ about ongoing developments in the scandal of Ketek. There is not a word about the further findings of manipulated results in Seroxat/Paxil clinical trials. UK doctors seemingly have no interest in the recent revised estimates of the number of individuals who are likely to have died (22,000) as a result of the failure by Bayer to disclose trasylol data in September 2006. 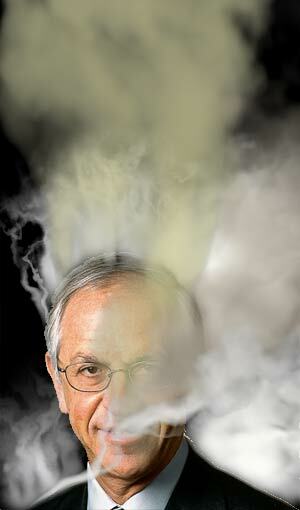 There is still nothing of any substance on the Ezetimibe scandal. The "Better Together" advertisement for Ezetimibe did not appear this week. The testosterone advertisement continues to appear. What is the half-life of a pharmaceutical scientific scandal? The half-life is about 3 weeks, and is fairly reproducible. Patient deaths and other accumulative effects are not shown. Apparently journalists and scientists are responsible for unsophisticated discussion of scientific misconduct involving GlaxoSmithKline products (Avandia, Seroxat/Paxil). So says Jean-Pierre Garnier chief executive of GlaxoSmithKline. "My wish for the media is to be more sophisticated when they report scientific news," he said at the presentation in London. "Debates now are being thrown into the public domain before scientists have given their opinion." Read on (Glaxo chief curses media and issues profit warning). I am a scientist and a doctor Mr Garnier ....... and the science stinks. That's my opinion. How does one have a "sophisticated" discussion about scientific misconduct? They just can't stop themselves - first looking to discredit scientists, then to discredit patients, then to discredit journalists - instead of addressing the shortcomings of their science and ethics. Never mind the non-transparent science. 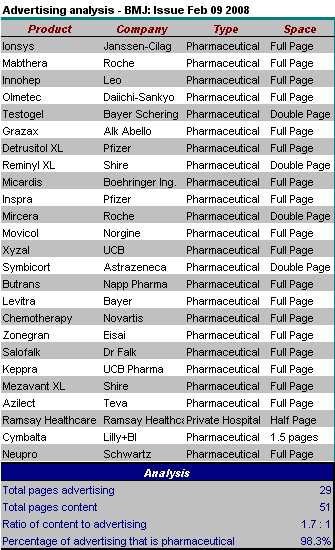 Never mind the apparent cheating of results in Paxil clinical trials. Never mind the selective publication of "positive" data. Never mind the false and evidence-free statements made about the safety of Paxil. Never mind the bullying of academics, witholding of information from prescribers, threats of legal action, involvement with the UK government, and non-existent criminal self investigations. Never mind Keller, Buse, Laden or study 329. Never mind the patients. Never mind the failure to answer actual scientific questions. He's got a f_cking nerve to demand that "scientists" (all scientists, or just the ones that agree with and are paid by GSK) are the only ones who are able to proclaim blatantly evident truths. We have only to read the correspondence between McCafferty, Oakes, Keller and Laden (who were responsible for the travesty of science that was the write-up of Paxil Protocol 329). Your company disobeyed the rules of science Jean-Pierre Garnier. 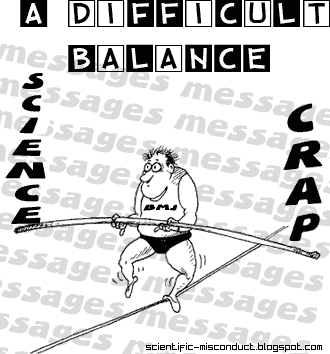 The scientific debate cannot be "sophisticated" because there is no real science. Sales are plummeting and the stock market isn't too pleased. That is excellent in my view. It is about time the stock market started realizing that in a "science based" business, what matters is the quality, transparency and honesty of the science, not the quality of the spin, cover-up and regulatory collusion. It's called the free market. Thinking patients are starting to take notice too. And what useless journalism in this Guardian piece. Here is some correspondence in Science 30 years ago in response to a graph and statistics in a paper by Roubik (Science 1978: 201;1030). I liked Hazen's response and the subsequent response by Roubik (not shown here). At least this is proper science. When things are visible and transparent they can be discussed. Despite the obvious over-fitting of data, the Roubik's paper was open and transparent (unlike a lot of the pharmaceutical literature). At least the data were shown. Misleading graphs formed part of the attempt by Procter and Gamble Pharmaceuticals (P&G) to interfere with scientific evidence about their osteoporosis drug Actonel. The problem was that it was not possible for anyone to know this (including the authors and scientists involved) because there was no data. This was compounded by further spinning of words in the embarrassing admission of guilt over the first of the three manuscripts. Watch this space. Scientists may disagree about the presentation of data, but there can be no legitimate debate when that data is not available, even to the authors. Vytorin - the mechanism for no-clinical-benefit ? This pre-print manuscript (in press, Atherosclerosis) doesn't seem to have been mentioned on a single blog - so I thought I would stick it up here. Could it explain all sorts of anti-pleotropic effects, and possible paradoxical worsening of atherosclerosis (or lack of effect) of Vytorin in the ENHANCE study? Any lipidologists out there please interpret. Ioanna Gouni-Berthold et. al. Atherosclerosis (2008) in Press: Effects of ezetimibe and/or simvastatin on LDL receptor protein expression and on LDL receptor and HMG-CoA reductase gene expression: A randomized trial in healthy men. Drawing histograms is a useful skill. Choosing the correct number of bars (size of interval) is important. Too few yield an uninformative plot. Too many will be difficult to read. This shows the number of studies designed to prove any clinical benefit of the drug Vytorin (zetia ezetimibe/simvastatin-combination) and the outcome. On a serious note: It is always important to visualize data before doing complicated statistical tests. PLOT THE BLOODY DATA. That is the most important rule of statistics (and of honest reporting of findings). Sturgis, H.A., “The Choice of a Class Interval”, Journal of the American Statistical Association, Vol. 21, pp.65-66, March, 1926. Last Wednesday, Senator Charles Grassley sent a letter to the HHS Secretary and FDA Commissioner detailing how Wyeth Pharmaceuticals engaged in a smear campaign aimed at discrediting an FDA safety officer (and GAP client) assigned to review one of Wyeth's animal care products. After Wyeth met with FDA officials and presented false and misleading information, the FDA wrongfully removed GAP client Dr. Victoria Hampshire from her position as the drug's reviewer. Dr. Hampshire previously found that Wyeth's ProHeart 6, a canine heartworm drug, was responsible for contributing to the deaths of hundreds of dogs. After following correct procedures in mid-2005, the drug was removed from the marketplace due to obvious safety concerns. Wyeth's threats to bring down high-level Bush administration pressure on the FDA if they refused to release confidential information. Wyeth's hiring of a public relations firm to research Dr. Hampshire's personal property and tax records. This same firm hired consultants to lie and mislead Dr. Hampshire into believing they were veterinarians in a feeble and failed attempt to entrap her into establishing a direct monetary relationship with a Wyeth competitor. Wyeth's hiring of a private investigator to 'dig up dirt' on Dr. Hampshire. FDA's opening of a criminal investigation into Dr. Hampshire's background, unbeknownst to her. This background saw a Wyeth subsidiary official repeatedly contacting FDA investigators in an attempt to guide their probe. FDA's referral of the criminal case, based on Wyeth's misleading "evidence," to the United States Attorney's Office of Maryland. That office declined to prosecute. This is a disgrace. It is not the way science is supposed to work. It is not the way scientists doing an honest job are supposed to be treated. Shame and more shame on Wyeth, and shame on those who have colluded, covered up, and "declined to prosecute" the criminals in this case. The Senator earlier sent a letter to Wyeth, demanding to know whether they paid private investigators to spy on the FDA official. A character called Clint Newsum, Wyeth's counsel, was heavily involved in all this. The same Clint Newsum has been paying off pet owners whose dogs have died after taking Proheart. On this website you can see the letters Clint Newsum has sent to bereaved pet owners, offering them "shut up" money on condition they stop speaking out about ProHeart causing their pet's deaths (and absolving Wyeth of any blame). 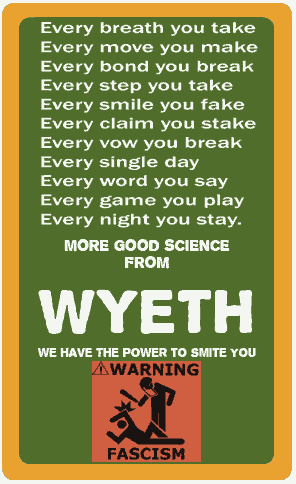 At Wyeth, our mission is to bring to the world pharmaceutical and health care products that improve lives and deliver outstanding value to our customers and shareholders. 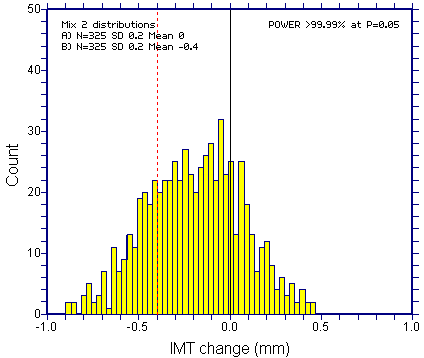 Micro Statistics Tutorial 04: Power - Can Schering Plough count? As discussed earlier, there have been concerns raised about the possibility of "functional unblinding" in the ENHANCE trial of the drug Vytorin (ezetimibe/simvastatin-combination). As the first part of this exercise, let us take a look at the POWER of the ENHANCE trial. There is something slightly odd here (I think). The question is: Can Schering-Plough count? 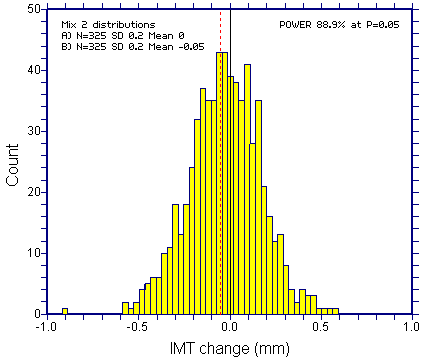 Although it is possible to perform power calculations taking account of covariates or confounders (such as baseline IMT, center and so on) this is difficult, and no estimated covariate parameters are provided. One therefore has to assume that the power calculations were carried out using conventional methods (a t-test). In the end Schering Plough recruited slightly more patients than their prior power calculation suggested they should recruit as a minimum. However this is not the issue here. They could also claim that this is just a bit of rounding error (see further discussion in comments). This is again irrelevant - the fact remains that it is not possible to add two and two from the numbers they give, or to resuscitate their rather simple calculations. This bypassed the entire system of safeguards that is supposed to check these little details. So on to the power. 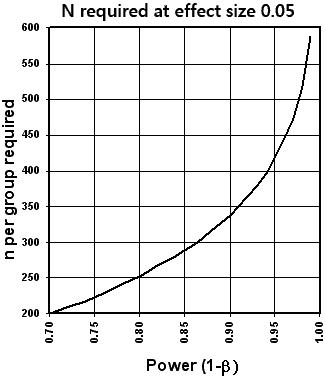 Well, as far as my humble brain can establish, Power for N=650 is in fact 88.9%, not 90%. 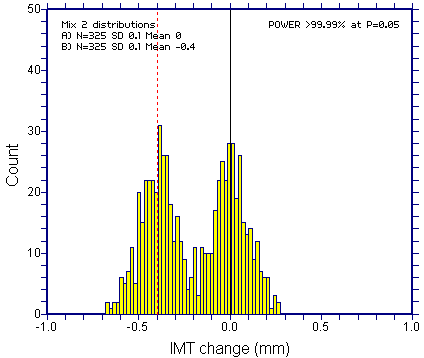 The required N for 90% Power, 2-tailed alpha 0.05, between group difference of 0.05mm and SD=0.20mm is not N=650. J. Kastelein, P. Sager, E. de Groot, E. Veltri (2005). Comparison of ezetimibe plus simvastatin versus simvastatin monotherapy on atherosclerosis progression in familial hypercholesterolemia. Design and rationale of the Ezetimibe and Simvastatin in Hypercholesterolemia Enhances Atherosclerosis Regression (ENHANCE) trial. Am Heart J. 2005 Feb;149(2):234-9. It is a poor scientist who refuses to explain what question they are answering. Most (not all) statistics is about prediction. Forecasting is about prediction of future events (usually, but not always, in advance of those events). For example, Carrie Smith Cox, President of Schering-Plough, dumped $28 million worth of stock before anyone knew about negative studies, altered endpoints or anything at all about the drug Vytorin (ezetimibe/simvastatin-combination). That is an example of forecasting. We might however want to predict events in one group of people, knowing what happened in another group. Here is where we introduce Dave, the Forecasting Pig (Reuters 31 Jan 2008). Dave lives in Ohio. He opines (or oswines) on US economic status, and is a key statistical tool used by the Ohio treasurer's office. Dave decides between a trough of sugar or one of sawdust to gauge the economy's future. Sadly, better methodologies are available (ask Carrie Smith Cox). Have you had the measles? Some say I should run a series of real-world statistics "tutorials". A bit like the good book Statistics at Square one but in juicier chunks. The stimulus was the wonderful letter in the BMJ (signed by around 20 statisticians) asserting that EU regulators should employ more card carrying statisticians to "explore methods and data in real depth". The claim for God-given magical powers of statisticians would carry more credibility if any of the signatories were commentators on instances of blatant fraud in clinical trials, or on the absence of actual data to "explore". 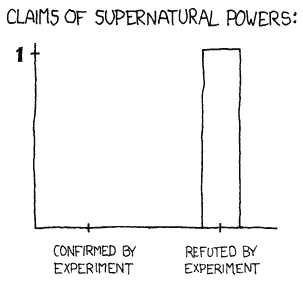 I like statisticians but they have no such magical powers. Most statistics is (and should be) transparent and straightforward. Some actual statisticians have screwed up, lied, colluded with fraud, colluded with ghosts, completely misunderstood the science, or agreed to the hiding-away of data. Most have stood by in silence. Please send along any examples. Here goes - the Scientific Misconduct Blog Micro-Statistics Tutorials. Some will be serious, others couched in frippery. The usual disclaimer: INAS (I'm Not A [proper card holding] Statistician). This is the updated "political chart" of pharmaceutical bloggers. For background see here. For details see here. Take the test here. Clicking individual "dots" should open the respective blogs in a new window. 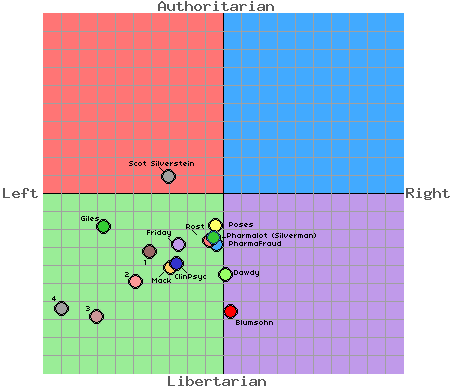 For comparison with historical political figures and UK political parties according to the authors of the test see here. Pharmalot - and the man behind it - Ed Silverman of The Star-Ledger of New Jersey. Superlative journalism and a key source. 1, 2 and 3 are three excellent and hard hitting (and deeply depressing) UK-based patient blogs devoted specifically to exposing misconduct and misrepresentation in clinical trials of Seroxat (Paxil) and various aspects of the integrity of GlaxoSmithKline. 4 is Honest Medicine. Julia Schopick created Honest Medicine in honor of her late husband, Tim Fisher, as a way to "work with others to make significant changes to the way people think about, and interact with, our flawed medical system." This test is significantly flawed, but we'll leave that for another day. Rules: As usual this is for the UK version of the BMJ. 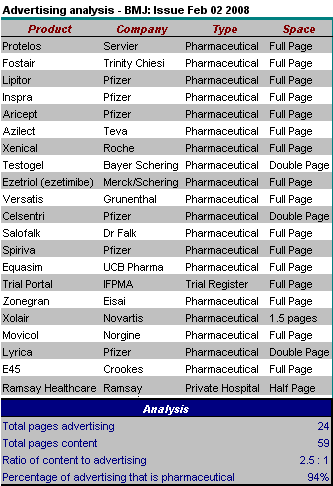 The classified advertisement section is excluded, as are pages advertising the BMA or products of the BMJ/BMA/BNF. 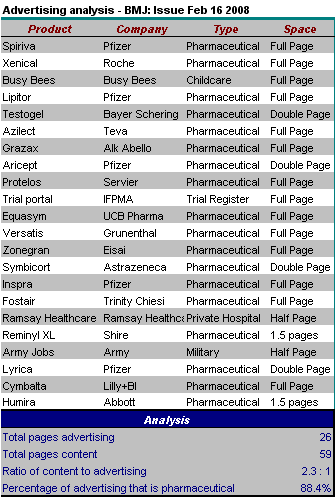 a one page advertisement for a register of clinical trials. Discussion about the Ezetimibe scandal: Following the terse news snippet last week about the shonky research underlying the approval of Ezetimibe (Ezetriol, Vytorin, Zetia) there remains no entry in the BMJ about the precise way in which the scientific community were deceived, the delayed reporting, the attempts to circumvent investigators and to alter endpoints, the interesting sale of Schering shares ($25 million) by an executive, or any discussion of the principles of good science. However this issue had an advertisement for Ezetimibe ("Better Together"). The advertisement fails to mention that the only evidence available so far suggests that the drug has no clinical benefit. It also doesn't mention what happened to the data. A letter from a reader (Jeremy Stone) complaining about discordance between a double page advertisement for testosterone supplements in the previous issue, and (on the very next page) a double blind RCT showing that testosterone supplements have no effect on functional mobility, muscle strength, cognitive function, bone mineral density or quality of life. I'll look out for proper referencing in the next appearance of this advertisement. They might even want to reference our paper showing that testosterone supplementation does nothing useful to anything (except plasma testosterone). There was a dismal letter signed by around 20 statisticians asserting that the EU regulatory agencies should employ more card carrying statisticians to "explore methods and data in real depth". The plea for employment and the special God-given powers of statisticians would carry more credibility if there were evidence that any of the signatories were regular commentators on instances of blatant fraud in clinical trials (no statistical expertise required) or on the fact that neither regulators nor scientific authors have genuine raw data to "explore" in any case. None (as far as I am aware) have commented on Ezetimibe. Statisticians would also do well to realize that only a few aspects of data integrity are within the special remit of complex statistics. All scientists require raw data. There was a detailed Obituary of Moses Judah Folkman (the "father of angiogenesis") by Jeanne Lenzer. In contrast to other Folkman obituaries it did at least mention that he had been forced to "apologise" over scientific fraud (false descriptions of methodology and falsified findings in an NEJM publication). "Whom the Gods wish to destroy, they first make mad"
Over the past few years I have listened to many cheerless stories of individuals who have exposed unacceptable practices within universities and hospitals. The institutional response is almost formulaic. A frequent part of the common experience is the abuse of occupational health procedures. Following an incident this week involving a colleague, I have summarised some aspects of UK occupational health law below. Most of these individuals started with the belief that their institutions would assume responsibility for upholding their own rules of conduct. They assumed that responses would be honest, colleagues and professional bodies would behave honorably, and that someone would take responsibility for the safety of the product (whether that product is a drug, honest science, open academic discourse or care of individual patients). In reality, most are projected into an Alice in Wonderland world of sham procedures, collusion, lies and bullying. Many become ill (see the case of Dr Z), and some die. Distress signals are used by poor managers to invent "health concerns" and to avoid rational discussion about genuine problems. That hospitals and medical schools abuse their staff through health mechanisms is indicative of deep immorality within these institutions. The process usually starts as an apparent expression of genuine concern about the health of the employee. 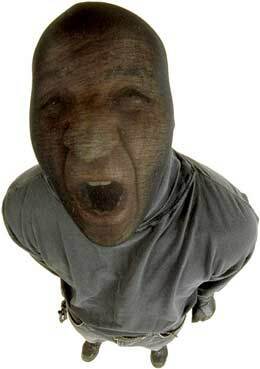 Sadly, psychopathic administrators and medical leaders are rarely subjected to psychiatric or medical evaluation. Employees should almost never agree to an employer's "offer" of health evaluation under these circumstances. When such evaluation takes place, it should only be for the benefit of the employee. Any assertion by the employer that they must have any right of access to health information is illegal and constitutes serious bullying. The physical occupational health (OH) records technically belong to the employer, but the employer has no right of control or access to the information therein. OH doctors should have an agreement their employer with regard to confidentiality of records. If the doctor leaves the company, records remain the property of the employer, but should be passed to a new doctor or nurse with the same obligations. 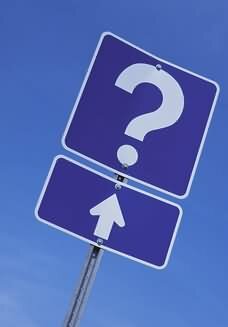 If an employee moves to another employment, OH records can only be transferred to the new employer with consent. Employers cannot enforce terms in contracts of employment stating that employees must provide copies of medical records. OH doctors have a duty of confidence which is the same as that for any other doctor. For example, if an OH physician were to reveal to the human resources department (without permission) that an employee has a drink problem the doctor could be sued for damages. Secretarial staff who have access to confidential information share these obligations. If consent is provided, it can later be withdrawn. Consent should be in writing for the protection of the doctor or nurse. Consent should clarify exactly what records may be passed over - not simply "all records". The OH doctor can refuse to accept partial consent if that would be misleading through omission. An OH doctor should not communicate with the patient's own doctor without consent. Guidance from the Nursing and Midwifery Council (2002) is more coherent with greater emphasis on the purpose for which information was supplied: "To trust another person with private and personal information about yourself is a significant matter. If a person to whom that information is given is a nurse, midwife or health visitor, the patient or client has a right to believe that this information, given in confidence, will only be used for the purposes for which it was given and will not be released to others without their permission". Mere attendance at the OH department does not imply consent. Even if an employer is facing legal action by an employee, OH records should not be disclosed to the employer without consent or a court order. An occupational health doctor may find that an individual is somehow unfit for a job or that the employee is in danger. This does not justify a breach of confidence. If the danger is to others there may be a case for breach of confidence, but even then this requires very careful deliberation. Per the Faculty of Occupational Medicine's Guidance on ethics: "Occasionally the occupational physician ....may find that an individual is unfit for a job where the safety of other workers or the public is concerned. He should then take great care to explain fully why he thinks the disclosure of unfitness is necessary.... Where this is not obtained the occupational physician is faced with an ethical dilemma..... Ultimately, the safety of other workers and the general public must prevail..."
Occupational health doctors should not become involved in advising employers on the validity or otherwise of sickness absence of an employee. They can however (in consultation with the employee) advise management on potential changes required to the conditions of employment. The doctor may also advise the employer about future employability but without providing clinical details of sickness to the employer. Some occupational health records may be of direct relevance to the employer (for example where the employer has a legal requirement to monitor toxic substances). Those records should be maintained separately from other records. Conveying of such records also requires consent.